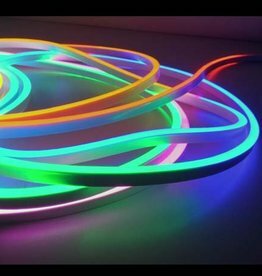 Magic / Dream color RGB LED Strip 5 meter without accessories. IP65. Each section of 3 LEDs is separately controlled by the digital LED Strip controller, making spectacular effects possible! 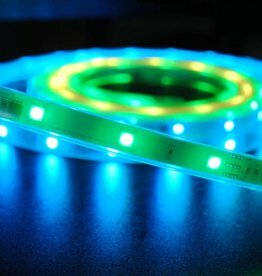 High quality digital IC1903 waterproof flexible LED strip with 60 LEDs per meter. Each LED is individually addressable, giving this LED strip a very high resolution of 60 pixels/m! These digital LED strips are IP65 waterproof thanks to the hollow silicone tube encasing. There are many situations in which a digital LED strip can offer a solution. For example, you could have a situation where you want a single LED strip which can show 1 meter of blue, then one meter of yellow, and then another meter of blue light. In such cases, a digital LED strip is also very suitable. This is also the case for colored squares or a work of art or an object which needs to be lighted in a number of different ways. Using a normal strip, this would get complicated. When using digital LED strips, you can use only one strip and controller for this. We also sell a digital controller which can be used to program the digital IP65 LED strip pixel per pixel. This makes it possible to create your own unique light-setup which behaves exactly like you want. 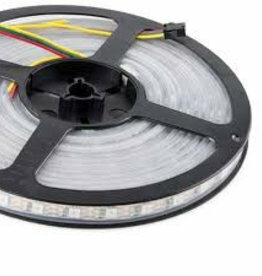 Do you need some help with the installation or programming of your digital waterproof LED strips? Please contact us, and we will be happy to help. If you have a special project or idea for digital LED strips we are always available for help and tips.